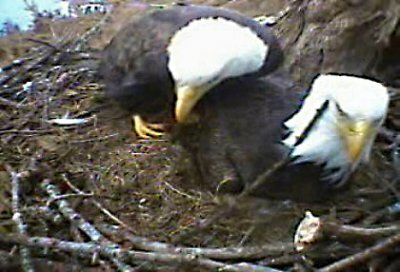 In 2006 the word spread and thousands of people tuned in to Doug Carrick's live webcam on the bald eagle nest in the Douglas Fir tree near his home on Hornby Island, Canada. 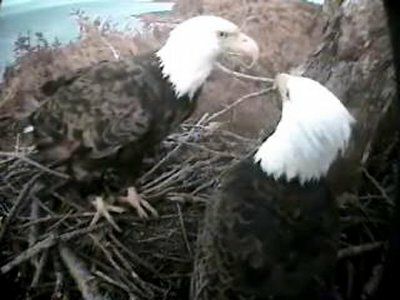 The world had an incredibly close and intimate view of the life of a pair of nesting eagles who became known as Mom and Dad Hornby. Below are some of the amazing moments captured in screenshots and photos over the past few years. 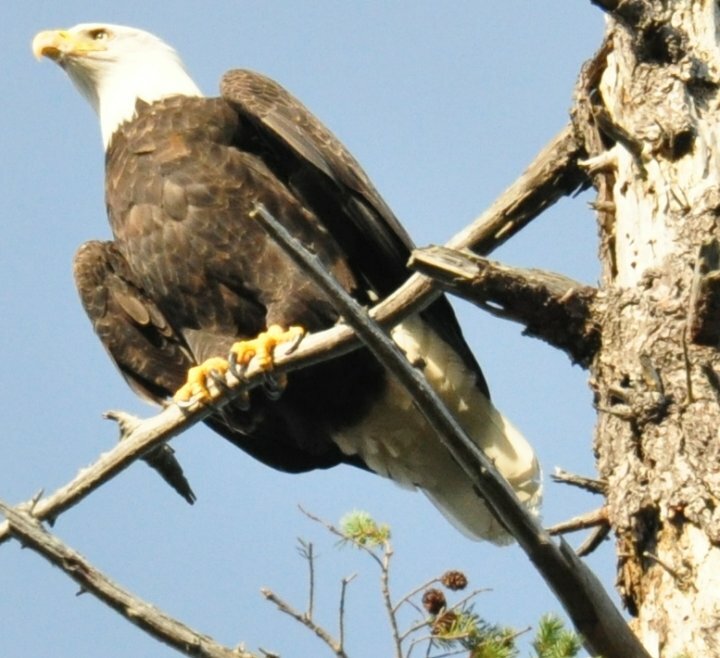 2006 brought joy to the devoted followers of the eagle pair who were incubating 2 eggs. It also brought great sadness when both eggs failed to hatch. There were many touching scenes and memorable moments. In 2007 the cameras weren't operating, even for Doug, as the result of a storm. Doug had to watch with his telescope. 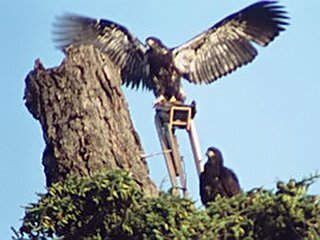 He saw only one eaglet - until he checked the nest after a thunder and lightning storm when two eaglets were visible - hence their names "Thunder" and "Lightning"
The Hornby nest was streamed again in March 2008. 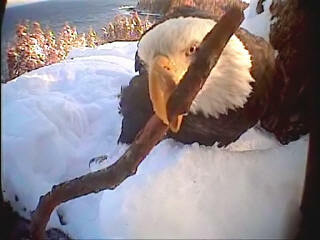 By the end of April, the nest had lots of sticks but Mom Hornby did not lay eggs. 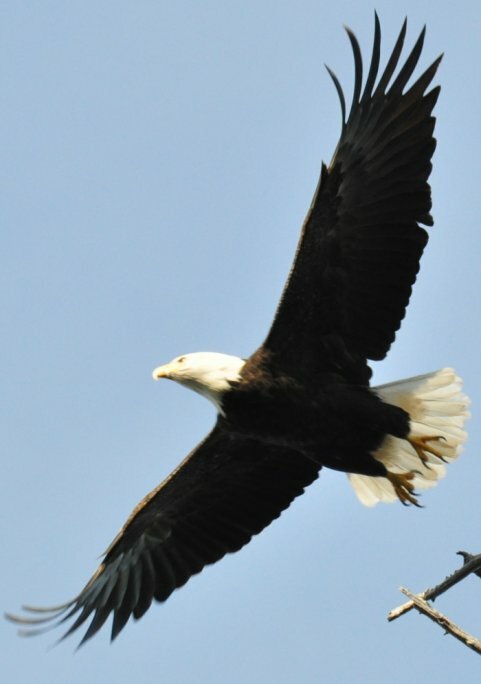 Both eagles visited the nest often, bringing sticks and grass and sometimes food items, including an opossum. The broadcast was turned off in June. 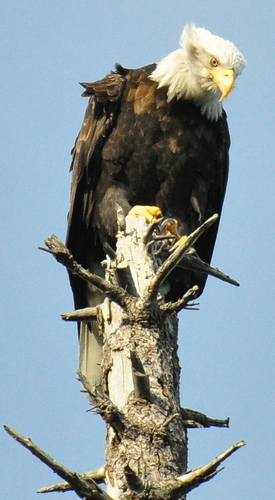 In 2009 the world watched once more as Mom and Dad Hornby produced two eggs and two eaglets appeared right on cue. 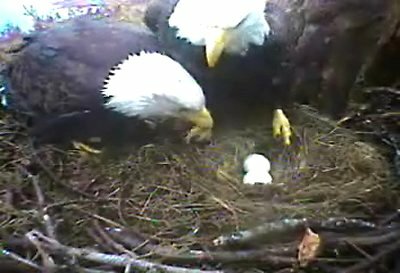 The first eaglet hatched on April 27. Doug named her "Hope," representative of what has happened at the nest over the past few years and how people have felt about the nest and the eagles. Three days later "Echo" arrived. Unfortunately, the live broadcast failed at the crucial moment when Echo hatched, leaving everyone on tenterhooks and disappointed. Fortunately, Doug was taping the event on his computer. Here is one of the very precious moments he recorded. (Press the "play" button to view Flash animation). Due to an unfortunate accident, Echo died at 11 days of age. 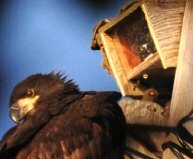 Hope grew into a strong and feisty young eaglet and fledged on July 21. 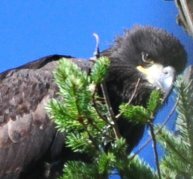 Late in 2009 the Hornby Eagle Group (HEG) was formed and the website and Forum were launched at the end of the year in time for the 2010 nesting season. Mom and Dad returned on schedule on 2nd October, 2009. Mom Hornby laid two eggs, the first on March 20 and the second on March 24. 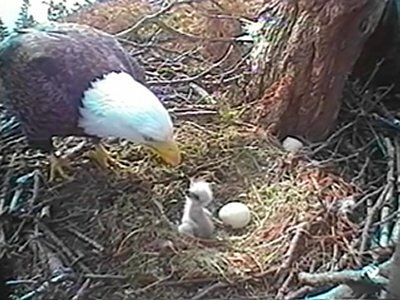 One egg hatched on April 29 and Doug named the eaglet "Phoenix." The second egg never hatched. 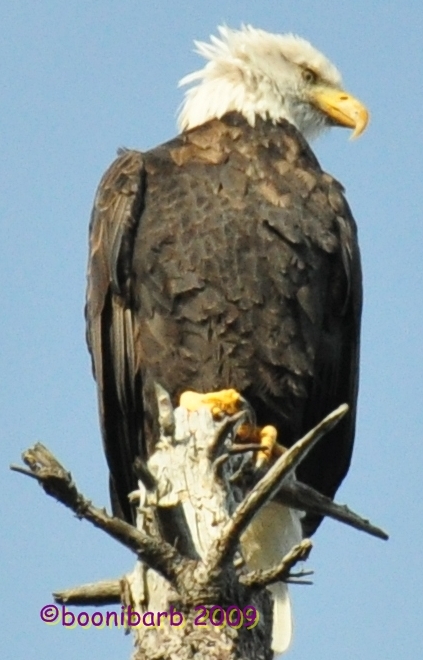 It remained in the nest until damaged by Dad and then consumed by Mom on June 11. Sadly, Phoenix died at 76 days of age after the rapid onset of acute bilateral mycotic pneumonia. 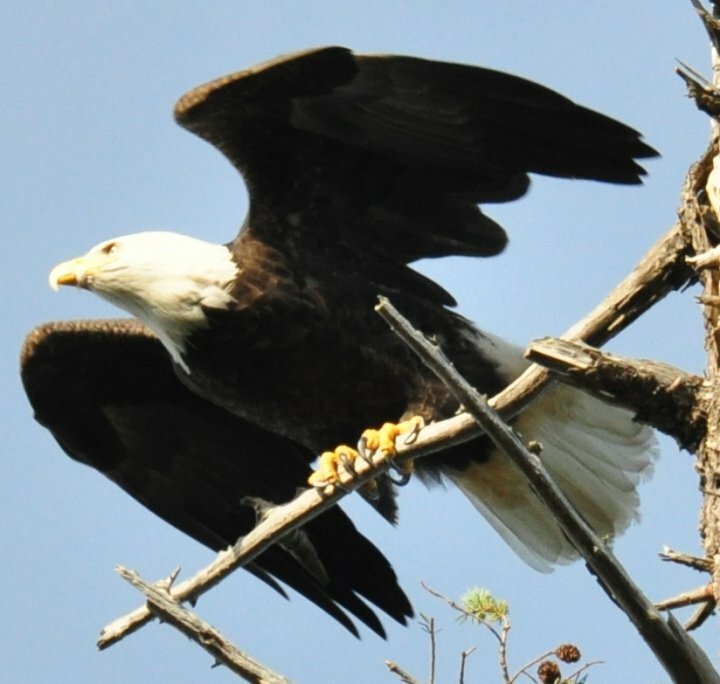 Our beloved eaglet Phoenix died suddenly on Wednesday July 14 2010, at 76 days of age. She was taken to the British Columbia Animal Health Lab, where cause of death was determined. To read the full report, please click here. We thank the British Columbia Ministry of Environment, Mountainaire Avian Rescue Society (MARS), climber (Dan Hamilton), Wildlife Rescue helicopter pilot, Norm Snihur and the British Columbia Animal Health Laboratory for their efforts, as well as the many people from around the world who contacted us with messages of sympathy and support. and we mourn with Mom and Dad Hornby. 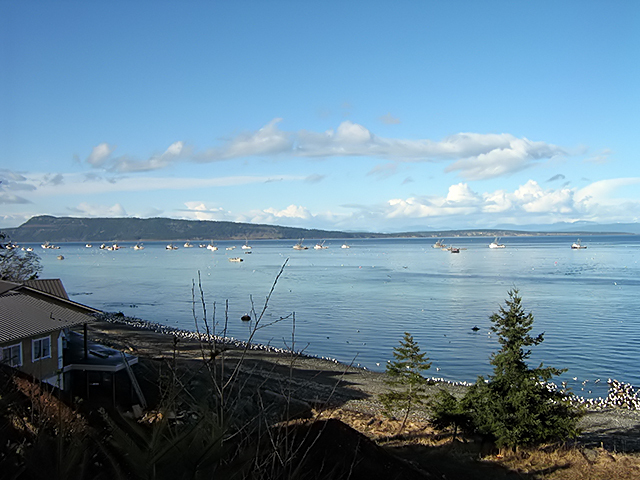 Hornby Island is located in British Columbia, Canada. It is a Northern Gulf Island in the Strait of Georgia . Draggers fish for herring during the March herring spawn. Mt. Geoffrey in background. 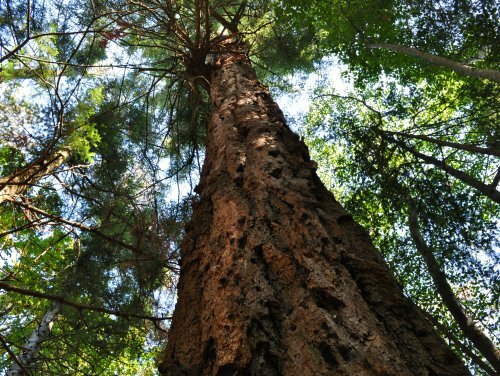 The Hornbys begin major nest repairs in October, bringing large branches for the outside and twigs for the inside. They work together when placing larger sticks but don't always agree on placement; Mom usually has final say. From mid-February to mid-March, they add more branches and bring grasses and moss to fill nooks and crannies. More grasses are arranged in the nest bowl as soft bedding for the anticipated, precious eggs. 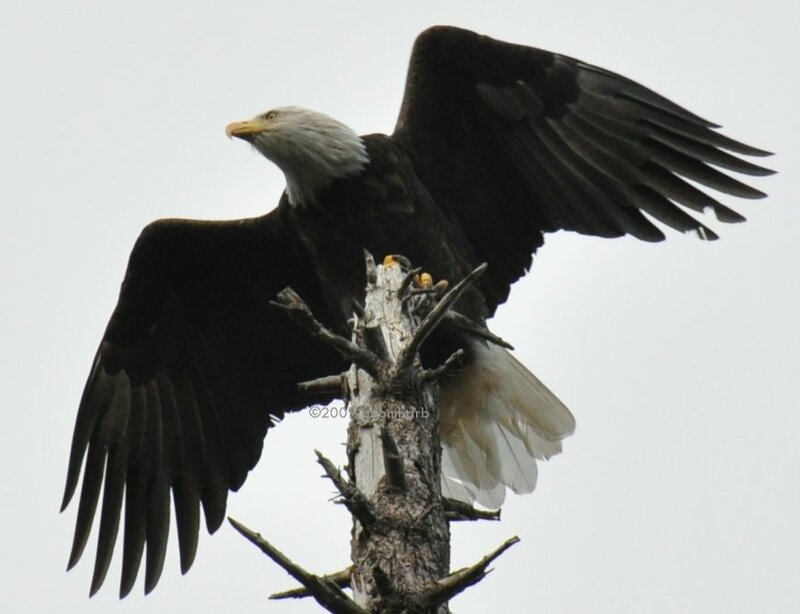 The Hornby Island eagles make frequent trips to the beach in search of food. They often find fish and other sea life in tide pools during low tide. Sometimes they compete with seagulls, crows, and other birds for the food and they will sometimes steal the food that other birds have caught. 2010 Nesting Season Highlights. Click here.